Don't Fret About That Dent! Dents happen, but help is here. Take the sting out of that ding and the next time your car gets a dent call My Dent Guy for a repair that prioritizes your time, schedule, and money. For paintless dent repair on the go, My Dent Guy will travel to your location at a time that is convenient for you, doing the job while you wait, with your ultimate satisfaction our top goal. With extensive auto body repair experience, none of the overhead cost that comes along with a dealer or body shop repair, and a passion for our customers, you can trust My Dent Guy to take care of your car and your pocketbook. We provide free and fast electronic estimates, and our customer testimonials speak for themselves. Call (239) 564-3368 or click get an estimate. Dent Removal The Right Way. 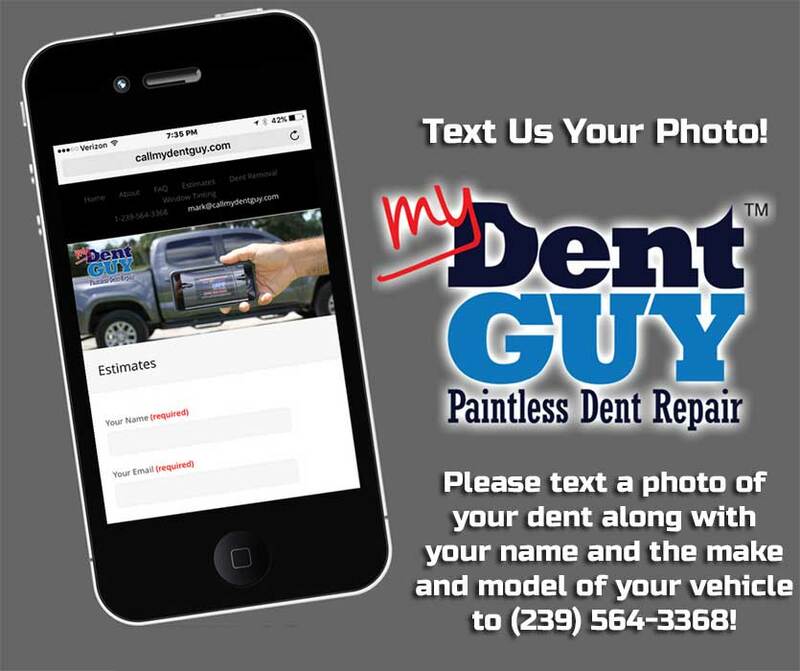 My Dent Guy provides mobile paintless dent repair. We work on all kinds of cars, from new to classic. We travel with our equipment so once we’re on-site we’ll do everything we can to get the job done in a timely manner. Dent Removal When And Where You Need It. We respond anywhere in the Southwest Florida area, from Marco Island to Fort Myers, and Old Naples to Golden Gate. We will meet you where it is convenient, whether your home or workplace, at a time that works for you. Quality, reliability and professionalism carry through every job we do. Not every dent will be the right fit for us, and we promise to be honest with you about whether and how we can help. Above all, your satisfaction matters. Our reputation is everything to us, and much of our business comes from word of mouth because our customers know they can trust us. Please feel free to call us or request an estimate and we look forward to helping you make that unsightly ding or dent a thing of the past. Here are the most frequently asked questions of My Dent Guy! Paintless dent removal is a process for removing dents from a vehicle without damaging the factory paint. It is commonly done from behind the body panels to reduce the invasive nature of tools and preserve the paint. Depending on where on the car the dent is located, we may rely on other techniques and equipment, but all of our methods are industry-standard and gentle on your vehicle, as well as able to be performed on the go and at your location. Is this process going to damage my paint? This process of paintless dent repair involves gentle massaging of the exterior of the car from the interior side, as well as using glue tabs to pull from the outside. If you have the original factory finish on the vehicle with no broken paint, the integrity of the paint should be preserved. Can you repair plastic bumpers? In many instances, yes, we are able to offer dent removal for bumpers. For many plastic bumpers, minor dents and dings can be remedied using the same techniques we apply around the body of your car. Please provide an accurate and high-quality photo so we can give you a thorough estimate. What kind of cars do you work on? My Dent Guy is able to repair dents and dings on all kinds of cars and SUVs, from brand-new to classic. We respect your investment and treat it with the care we would our own. 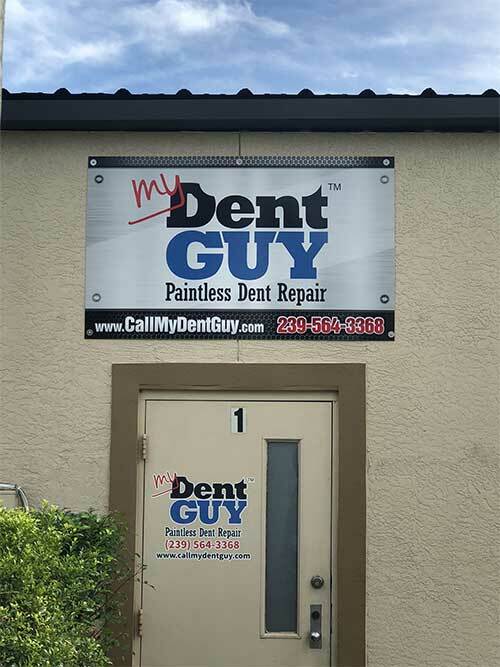 My Dent Guy is fully mobile throughout Southwest Florida. We will travel as far south as Marco Island and north to Fort Myers, throughout greater Naples, as well as east to Golden Gate Estates. We travel to you, whether that be your home or workplace. We will work with your schedule to confirm a time that meets your needs. Can paintless dent repair fix all types of damage? Major collision damage will be more than we can reasonably repair, but we are happy to discuss with you on a case-by-case basis. The accuracy of our preliminary estimate will depend on the quality of the photo of the damage that you provide. We are not formally affiliated with any dealerships or other collision repair facilities, but operate fully independently, so will not make specific recommendations but can offer our basic recommendations if your car’s damage is too severe for us to repair. What are the advantages to mobile paintless dent repair? By taking the middleman and overhead out of the repair process, My Dent Guy offers a superior service at a fraction of the price with your convenience and satisfaction our top priorities. 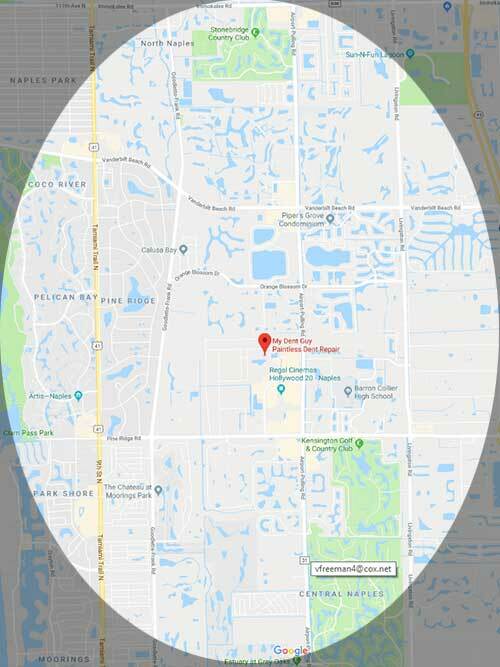 For minor dent and ding repair, we are a trusted source in Southwest Florida with many customer testimonials and referrals backing up our service. You can be confident we will approach your repair with integrity, transparency, and a commitment to quality. With our competitive pricing, there is no need to involve an insurance claim, and no CarFax report will be generated.